Tyneside Loipers is the cross country ski club of northeast England. Founded in 1982 and covering mainly Northumberland, Durham and Tyne and Wear, we now have over 50 members active in all forms of nordic (freeheel) skiing. Some of us even ski in the summer months using roller skis. The club has a stock of metal-edged touring skis which can be used by members. New members are always welcome and will be offered help and advice about where to ski. Good conditions for skiing in the NE no longer happen every year but there are usually a few days when skiing is possible in the N Pennines or the Cheviots or a little further away in the Lake District. The club also organises foreign holidays or short breaks abroad. Typical trips include telemark skiing in the French Alps, track-skiing and nordic-touring in Norway and telemark touring in the Silvretta Alps of Austria and Switzerland. 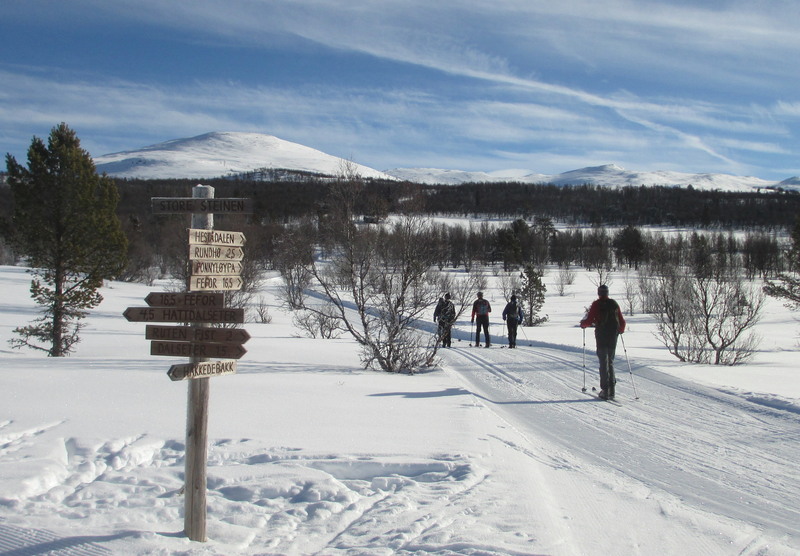 We have creatively reused the Norwegian word ‘loipe‘ – with the following definition from Wikipedia – ‘a cross-country ski trail or loipe is a route laid out, constructed and maintained for cross country skiing‘. The name has stuck and we are commonly referred to by the other clubs as ‘The Loipers’. Tyneside Loipers started life in 1982 as Tynemouth College Cross Country Ski Club. Founder members Helen Charlton and Sylvia Dowd quickly built up a following of 100+ members and the name changed to Tyneside Loipers to reflect the wider membership. These were the days of more widespread winter snowfall. Through to the late 1980s the club had a programme of regular winter meets in the Border Forest and the Cheviots. But sadly snow became less reliable and the membership dwindled. One of our regular Scottish venues was Glenfeshie Hostel. Even through to the year 2000 we would usually have a club weekend at the hostel over the early May Bank Holiday with sometimes a dozen members turning out. There always seemed to be enough snow either on the Cairngorm ski hill or on the surrounding tops or perhaps in Lurchers Gully. Today the club has a stable membership of about 55 members, helped partly by cheaper air fares and the opportunity to ski in the Alps or Scandinavia. Members ski in the N Pennines and elsewhere in Northumberland and Durham when conditions permit but also go away on club trips to indulge in cross country track skiing, nordic touring and telemarking. The Club’s constitution (Word document) can be viewed here. See what events the club has planned this year. Find out all the ways to get in touch with the club.